Hits a Big Buck’s Sweet Spot! Growing like a wildfire — with HUNTER’S being our greatest sales force! 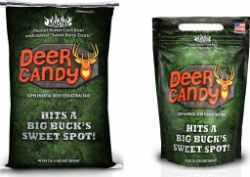 The action that Deer Candy provides from pouring out just one bag of Deer Candy is phenomenal! Hunter’s are reporting consistently they’re seeing the fastest and most intense accumulation of deer with this product they have ever seen! Take a Trail Camera and just one bag of Deer Candy and you’ll see for yourself. Action can get a little crazy using Deer Candy — like from one deer to a whole herd coming to the aroma in a very short time. A superior blend of Roasted Peanuts, Corn, Bran and our own little secret of Berry Flavors — with a smell so good, you will have to resist trying it yourself! Shuts rice bran down! Options: 10 lb. 40 lb.